Vagrant Story (ベイグラントストーリー, Beiguranto Sutoorii?) is a Japanese-developed action role-playing game developed and published by Square (now Square Enix) for the PlayStation. The game was released in 2000, and has been re-released through the PlayStation Network for the PlayStation 3 and PlayStation Portable consoles eleven years later. 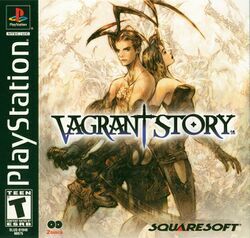 Vagrant Story was primarily developed by the team responsible for Final Fantasy Tactics, with Yasumi Matsuno serving as producer, writer and director. Vagrant Story is unique as a console action/adventure role-playing game in that it features no shops and no player interaction with other characters; instead, the game focuses on weapon creation and modification, as well as elements of puzzle-solving and strategy. The game takes place in the fictional kingdom of Valendia and the ruined city of Leá Monde. The story centers on Ashley Riot, an elite agent known as a Riskbreaker, who must travel to Leá Monde to investigate the link between a cult leader and a senior Valendian Parliament member, Duke Bardorba. In the prologue, Ashley is blamed for murdering the duke, and the game discloses the events that happen one week before the murder. This page was last edited on 3 May 2018, at 00:07.